New Zealand has a good base in grass roots sailing and some good keeler sailing but, in between, it loses many young sailors from the sport as they grow out of the Starling and shy away from the cost of continuing. It is a damn shame and it should not happen, so I’m here to push the virtues of just one alternative: the Farr 3.7. Oh sure, I’ll mention some other yachts that make viable stepping stones after the Starling, but basically I’m here to promote the 3.7. Some sailors proceed with Olympic Classes, but it is often high pressure and high budget - no wonder the majority drop out. It is defeated thinking to blame this drop out rate on ipods and university study. The cost of those campaigns and boats, plus the time commitment, is eye-watering. One option is the Laser: it is affordable and has good fleet numbers. It is a great option if you are keener on a hiking boat, as opposed to a trapeze boat like the 3.7. The Laser (including Laser Radial & the Laser 4.7) leads to other hiking boats such as the Europe, OK, and the Finn. It really depends on body shape/size if you want to carry on hiking out or progress to the trapeze option; ie, the skiff route. The 3.7 makes an ideal training platform before going into the bigger budget skiffs like the Javelin, 12-footers, R-Class, 49er or even a Foiling Moth. If you don't balloon out too much past 85kg later in life you will remain competitive in the 3.7 indefinitely. Most of the top racers are between 65kg and 75kg, but there have been sailors in the top five who have weighed over 90kg. The central North Island is healthy in terms of 3.7 fleet numbers. In Hamilton, Tauranga and Rotorua, some Starling sailors have moved on to the 3.7, and it works well if several sailors move on together with their peers, often with plenty of family support, such as towing the boat to the national championships. The South Island guys are centred around Canterbury, but any clubs sailing Starlings could consider accommodating a 3.7 fleet as a way of keeping sailors looking for the next level. However, some people never get too big for a Starling, and there is no sense leaving the Starling class prematurely: some seniors continue sailing Starlings. In the Auckland area the 3.7 sailing tends to be spread over many clubs so the class is trying to get boats together, summer and winter, over just a couple of venues to get bigger fleets with more focus. National contests for the 3.7 are steady at around 30 boats, but more boats, year round, would be better. The class has a huge age range; the oldest competitor at the recent nationals was 63 with another at 61 years. There were seven sailors in the under-21 competition; the two youngest sailors were 17. One of the strengths of the class is having senior class members who are actively sailing and happy to mentor the younger sailors. The recent national champs had a party atmosphere and there was plenty of help available to sailors between races. Getting rid of the gold-medal hyper types into the Olympic Classes lets everyone else breathe a sigh of relief. However, the 3.7 attracts top sailors; most of the national champions have won similar titles in another class. 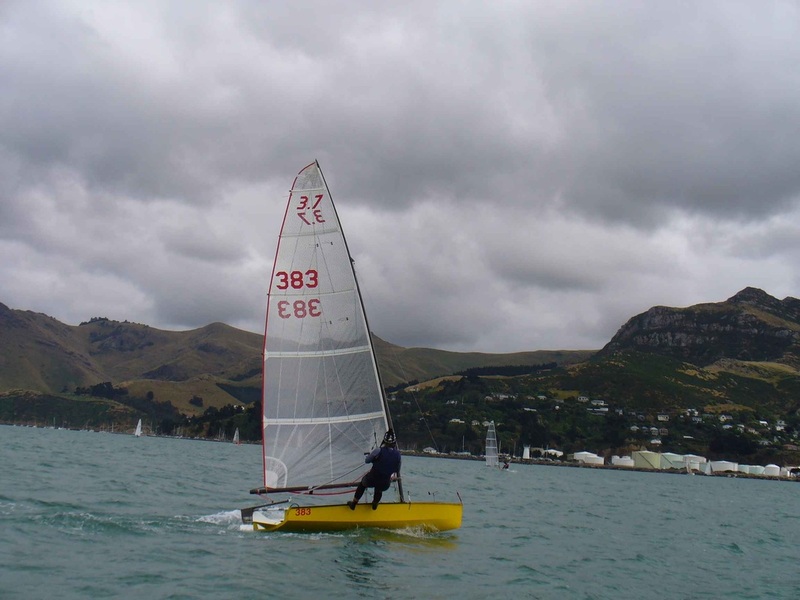 Derek Scott, the current titleholder, has won the Tanner and Tauranga Cups in P-Class and been a repeat winner in the Etchells. Initially, the 3.7 looks and sails like a big Starling with a flat run aft, but it is bigger, taller, faster and more fun. In the days when GT meant your car had a twin cam with lumpy idling, the 3.7 used to be called the GT Starling - with apologies to both designers. These days I guess we'd call it a WRX Starling. When you sail a 3.7 trapezing on a reach, the buzz is fantastic. 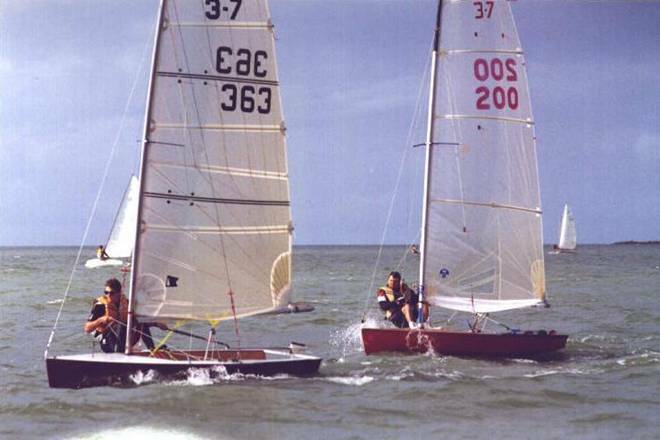 The downwind/reaching photo of Malcolm Paine sailing 382 with Alan Paine in 381 in the background is a good example, but sailing in flat water on a tight reach is even better. The hulls are 3.7m (12ft) long. They are proportionately lighter than a Starling and intended to be planed upwind. The 6m masts are typically carbon with fully battened mains; most are rotating. The booms are 2.2m long; the centreboards are 1.37m long. The one-design hulls are measured in a jig. The rig, sail and boards are simple to measure and permit some development to suit the individual. 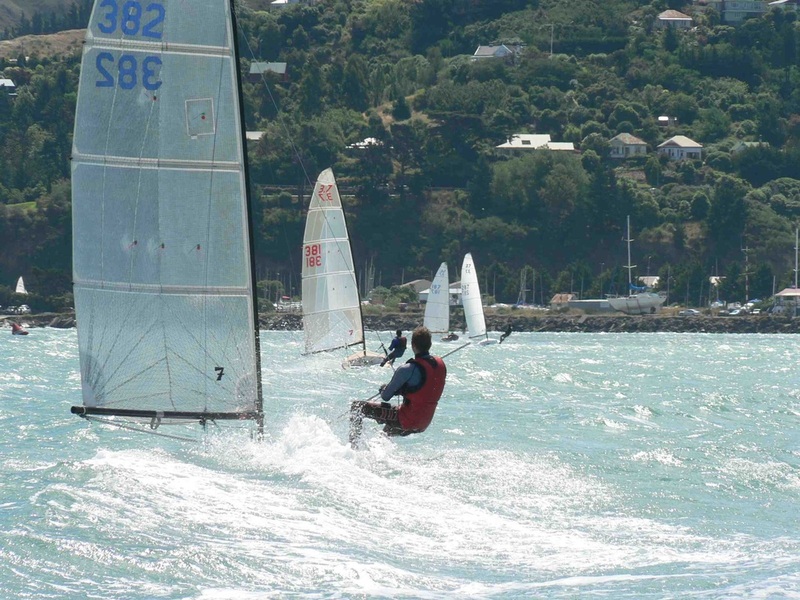 The boats do not perform in any sort of breeze unless they are sailed flat upwind – see the photograph of Kim Humphreys in 287 sailing upwind at Lyttelton in 2007. So, you sail the boat flat, you use the vang to hold the leech firm and you use the mainsheet to control boom angle. In higher winds you rake the board aft, raising it slightly if you are overpowered and you sheet the mainsail fairly wide off the centreline. The boats foot well and you mustn’t pinch. The outhaul, cunningham and vang controls all need to be in synch. Downwind the boats are underpowered in the light, but all hell breaks loose when it is windy. The good news is that they are easy to right and have a self-draining cockpit. And, once you crack it, you don’t need to swim any more. Most people who think they know a lot about sailing tend to re-assess that opinion when they first get a 3.7. But for those who master it, the satisfaction and the buzz is really worthwhile. They are a challenge which keeps anyone’s interest in sailing alive and helps to move them to the next level. Like the Zephyr and some other great New Zealand classes enjoying growth in recent times, it is harder to find good used boats and people do build new ones. Meanwhile boats for sale are listed and circulated regularly in the free email newsletters and boats sell on Trademe. Before buying any 3.7, checking its recent measurement history with class secretary John Elliott. If you’re interested but want to know more about the 3.7, contact your local 3.7 Association. Offer to help on the club patrol boats to get up close to the boats sailing. If you’re still keen, see if you can go for a ride but watch out, once you’re on the trapeze, you’ll be hooked.